Several of us disagree. It must be the Aliens. They have altered the temperature of the earth's core. Whether hell is hot or cold is actually a debated question, depending upon its expansion rate. If it is expanding faster than souls are moving in, then according to Boyle's Law the temperature would be cold, possibly freezing. If it is staying the same size or expanding at a slower rate than souls move in, then it is hot. A supposed chemistry exam answer on this subject explains in more detail and with a good punch line. 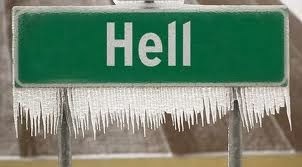 I don't think hell is freezing over any time soon, either! Hell will freeze over when hell freezes over? Ha ha awesome! But is there a heaven and hell? And if there is no hell, then what would freeze over? Miami? Hey wow! You got a picture of hell? Was that from your vacation last year? Did you use a flash? One third the size of the moon? Could you imagine all of the world's condemned throughout history being crammed into a space that size? That sounds like Hell on Earth. Or you know, Hell beneath Earth. I read the comments and they are funny. I loved the sign. That's cool. I don't whether hell is hot or cold and I hope I don't have to find out. ReformingGeek- It seems they are everywhere these days, and now they're messing with hell. laughingmom- There's a unique thought. Frank- Interesting theory, but a little deep for me. Meleah- I don't think so either, despite the sign. Cheryl- Sorry for all your inclimate weather. I won't say spring is just around the corner, but it is on it's way. Nicky- Good point...I think it's hot too. Katherine- That's about the size of it. nonamedufus- About the same chance, I'd guess. Margaret- Thankfully no. If I had a vacation like that I'd ask for a refund. KZ- I thought that size comparison was interesting. Never thought about the size of the inner earth. You're right, though, it might get crowded...just like topside in places. Sara- I don't want any personal experience with it either.